Discussion in 'malware problems & news' started by deebo, Oct 29, 2005. I have it and have run all my "defenders" and it is still there. It seems to be in my program files\winupdates\winupdates exe. How do I get rid of the crap in the simpliest manner possible? I am not that good with changing registries and such. Reboot and check if taskmanager, regedit etc are working as they should. You should now be able to remove anything that was left behind. Thanks for the quick response. I'll get right on it and let you know what happens. Yeah Buddy! I have control again!. Thanks a million for the very helpful info. Thanks, a ton, dont know what that did, but it worked. None of my programs could scan or delete it. Norton virus detecor doesnt keep popping up now, thanks again. CS: 0555 IP:0102 OP: ff ff 8a c4 8b choose 'close' to terminate the application. Before I used the BFU thing, there was one thing other than alcra.b, that showed when I used Norton Anit-Virus. Now it doesn't appear. Is it safe to leave my computer like this. If not what should I do? EDIT: I think the computer is still infected because it is slow and there are currently 36 processes running. Is this normal? I would attach a picture with these showing but I don't know how. If it is needed I can. EDIT #2: This morning I after running Ad-Aware it came up with Alcan.A. After deleting that I can access the registry. But now when I scan again with Ad-Aware it pops up again. How should I deal with it. Please note that the p2pnetwork.bfu will no longer be updated. Please follow up by scanning your computer for malware, preferably in safe mode. This is necessary since the BFU isn't, and never will be, able to remove all of the adware. The BFU first kills the Worms processes, then it removes the registry entries it uses to restart, then it removes the files and folders. It should at the very least return your computer to a much more workable state. also in my Task Manager my session id is not showing how much memory it is using. I found the error and uploaded a new script. Can you try the new one please and let us know? The run time error 5 usually means I tried to delete a registry value instead of a key. Hi. Sorry, I found this thread through Google and saw that it was quite recent so I tried the BFU thing, which greatly helped the speed of the computer. I used the latter of the scripts you told us to use. However, it's still unusually slow, and I normally have around 51 processes running. Every time I do a Norton virus scan it doesn't find anything, however looking through the reports and threat alerts I found a number of things, the worst of which looks to be W32.Alcra.B (found 15/02/06). I must have got this through LimeWire, the P2P program I have installed. Other RECENT (as of 2006) problems that were in the list include Adware.Starware and Downloader.Trojan. This is strange, as these things didn't come up after the scans had finished. The main symptoms of whatever problem I have is just general slowness of the whole machine and also frequent programs not responding. These programs normally crash when I try to close them (things such as Internet Explorer, Photoshop Elements, sometimes just folders). Other things to note are that I also have Ad-Aware SE and Spybot. Ad-Aware usually just finds tracking cookies and Spybot never finds anything. I also came across Alcragui when searching Google. This scanned my computer and said I had no problems. I think it's just a scanner for W32.Alcra. Another thing I found is a program called Registry Booster. I used my free scan and it found 190 problems. It can only remove 15 of them until I buy it. Should I buy it? I also have a question about BFU; should I run this script every day? Or is it only necessary once? I really have know clue what to do or even what I'm talking about when it comes to this kind of thing and that includes where would be a relevant place to post this since I don't know the problem. for analysis by the malware experts there to rule out any possible infections. Keep us posted as to your progress with this. It turns out the only problem was something called 'poker3'? Bobbi Flekman is a very helpful person. I'm surprised he finds the time to reply to all of these threads. Thank you all very much, ive spent about the last three hours trying to fix my computer, i knew from the start that i was infected with the alcra worm (or one of its variants) and bfu fixed it for me almost instantaneously, and it sure beats the hell out of tryin to remove it manually (if possible), the galdiator security site is also very helpful. 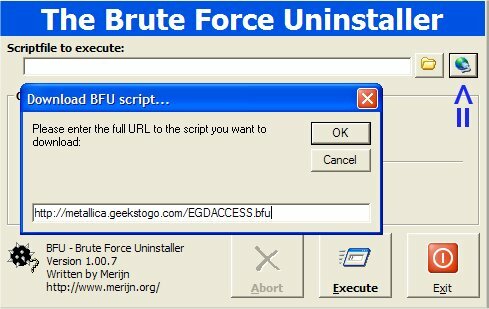 hey everybody, ive been trying to use bfu to run regedit.exe at my school, because its restricted and it would make my life a lot easier if i had access to it, but i cant seem to get it to work, if anybody knows how to do this, please let me know. Amazing. Truly outstanding, the service provided here. Holy cow. I was gone for the weekend. Just got back this evening. My wife had been using LimeWire while I was gone. Jumped on my machine and immediately realized I couldn't ping. "The NTVDM CPU has encountered an illegal instruction." Checked system variables and everything looked fine. Went to check registry and same error. DOH. Scanned and realized I had w32.alcra.b, but no fix tools available. Looked it up in Google, found this forum, and five minutes later everything is peachy again. Beautiful. I applaud you... standing ovation. Thank you so much. Where do I donate? Actually, I'm sure I can find such a link if it exists. Also, if any of you are ever in my neck of the woods, I'll be sure to reward you with food, drink and merriment. Where do I donate? Actually, I'm sure I can find such a link if it exists. Also, if any of you are ever in my neck of the woods, I'll be sure to reward you with food, drink and merriment. ... that could be expensive. Please help me too - I have tried everything in this thread, in fact I have downloaded and tried every suggestion I have found on the internet all evening - the BFU thing just gives me failed and file not found messages in the log, that doesn't work. The virus is in my Nortons portal folder and is now replicating itself and filling up the quarantine folder with 2,327kb files, how do I stop it please and how do I get rid of it out of that folder? Hello, lateralis! Have you performed a full scan with Norton ? Try to use an online scanner as Bit Defender or Trend Micro to clean your infection. Have u tried posting a HijackThis log at another forum for help as suggested here? If not, that's probably your best bet to get expert help in cleaning this malware and any other infections that might be on your system. Please note that BFU lists that error if it can't find a file or key. It does not list anything for all the files and key it did find. To my knowledge the alcanshorty.bfu script works on every known variant of the Alcan/Alcra worm and for a lot, but not all, the related malware it downloads and installs. So please follow snowbound's advice and have a expert look at your log what else might be going on. Or combine the script with a scan by a spyware/trojan/virusscanner (like Ewido for example).